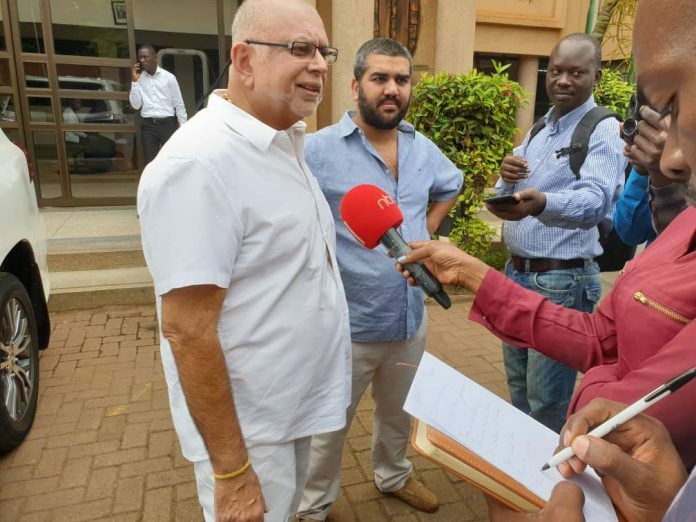 KAMPALA – City tycoon Sudhir Ruparelia is exasperated by city law firm for “hiding behind the court process” and pretending not to “tell when they are conflicted and stay away from a case”. “It is a very simple case of conflict of interest. If a lawyer who has done all these degrees doesn’t know he is conflicted, I don’t know who will,” he told reporters on Wednesday after the sidelines of the hearing of the application in which he has asked court to bar Sebalu & Lule Advocates from representing dfcu Bank, saying “they are conflicted”. The Commercial Court has deferred the hearing of the application to March 1, after it was communicated to all parties that the trial judge David Wangutusi was out of office. Mr. Ruparelia, in a suit filed in December last year at the commercial division of the High Court, pointed out that Sebalu & Lule Advocates should not be representing Bank of Uganda and dfcu Bank since it has already represented Crane Management Services that owned Crane Bank which was controversially sold to dfcu Bank in January 2017. The city businessman has already blocked another set of conflicted lawyers from arguing cases against him.